Last year my partner’s best childhood friend died of cancer. 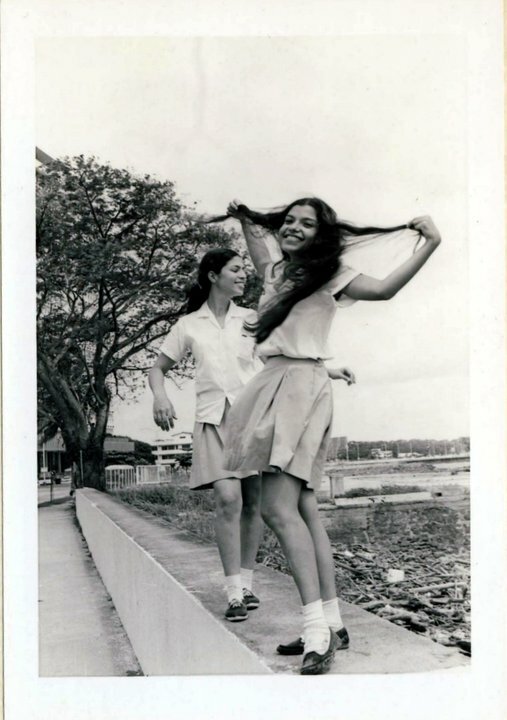 Arline changed her Facebook profile picture to a photograph of herself and Alma, dancing on the sea wall in Panama in their high school uniforms. She kept that picture up for almost a year, only replacing it with one of our black lab, when he, too, died of cancer. Those of us not involved in organized religion sometimes think of ourselves as lacking in rituals, but maybe our human need for ritual asserts itself regardless of how we do or don’t express faith. Changing our Facebook profile has become a kind of ritual. We assert solidarity with a cause or show off our children or, on our birthdays, scan in pictures of ourselves at five, grinning with missing teeth. Just as church-goers can snore through the service or sing out loud, we can engage in Facebook image rituals with varying levels of intensity. I also put our dog on my profile picture after he died, and when, a few months later, I tried to change it to something else, I couldn’t; it felt like a dishonor. Not until my birthday did I feel that I had a sufficiently good reason to change it. Birthdays, of course, are often awash in rituals. This year my birthday celebration was delayed until my parents returned from a trip, so I put a birthday candle in my frozen waffle in the morning, lit it, and sang happy birthday to myself while Arline laughed from the kitchen. We recently attended the wedding of our friends Emma and Genevieve; it was an opportunity to think about which rituals appeal to us and which don’t. If we married, I asked Arline, which of these traditions would we retain — the tossing of the bridal bouquet? the parental “giving away” of the bride? the cake? Definitely the cake. Outside the hall, in the lull between wedding ceremony and reception, we chatted with another lesbian couple about weddings and other life celebrations. The white woman made a comment I’ve heard many white people say, that our culture doesn’t have much ritual left. But I think she’s wrong. I think the rituals are just invisible to us, the same way other aspects of our culture are invisible to us white folks because they’re so dominant. We may not engage in the same traditions our grandparents did or go to a church to engage in them, but we still ritualize our lives. On my birthday, I wanted a candle. When our dog died, I wanted to signal my mourning to the world. Instead of wearing black, I posted his picture on Facebook. This entry was posted in Uncategorized and tagged death and dying. Bookmark the permalink. Allison, congrats on your inaugural post! I\’m so excited for your blog!!! I agree with Deborah… the cake would be my ritual! You mentioned organized religion and ritual, which is interesting, because I consider myself so a-religious, except when it comes to the Jewish rituals around death, which I do follow pretty closely. I think the ritual for shivah is reflective and beautiful. Also, the ritual of leaving a rock at a Jewish person\’s gravesite, rather than flowers, which I find so much more comforting because flowers die. I guess I never realized that I take comfort in these rituals, even though I don\’t take comfort in the religious aspects of my religion, if that makes any sense. But thank you for this \”heady\” insight at 6:35 a.m. on July 4th. I\’m going to put your blog on my RSS feed 🙂 .